Therapeutic exercises can be found spread out amongst numerous texts, handouts, card boxes, and websites, which has sent clinicians, practitioners, and trainers searching for reliable, evidence-based exercises for the entire body, all packaged into a single, all-inclusive manual. To that end, The Comprehensive Manual of Therapeutic Exercises: Orthopedic and General Conditions was written as a fundamental resource on exercise theory and techniques, and as a comprehensive guide for designing exercise programs. 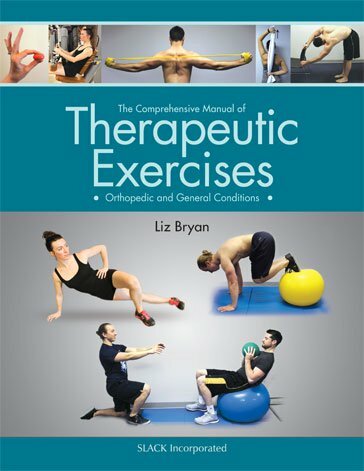 Dr. Elizabeth Bryan has compiled thousands of clinically relevant exercises to create a text that will teach students theory and proper application that they will then return to again and again in their career as a reference to aid in designing evidence-based exercise programs for their clients or patients. Introductory chapters cover exercise parameters, exercise progression, the importance of form, muscle soreness, and a reference for body position terminology, then subsequent chapters are organized by body area to cover most of the clinical exercises in use today. Each exercise includes photographs, a list of muscle systems that will be affected, specific substitutions to look for, and detailed instructions directed at students and clinicians. Also included are sections devoted to protocols and specialty exercises including yoga and tai chi. Embracing the principles of evidence-based practice, “Where’s the Evidence?” boxes are prominently featured throughout the text to support the exercises and theory with up-to-date, relevant, sufficient, valid, and reliable studies. Combining theory with practice, The Comprehensive Manual of Therapeutic Exercises: Orthopedic and General Conditions is an essential tool for students as well as clinicians, practitioners, or trainers to find the most appropriate exercises for their client’s or patient’s needs and apply them properly. Elizabeth Bryan, PT, DPT, OCS received her BA in Biology in 1995 from Missouri Valley College in Marshall, MO and her BHS in Physical Therapy from the University of Missouri in Columbia in 1998. She went on to work in the outpatient Orthopedic setting at Fitzgibbon Hospital in Marshall, MO before moving to Colorado Springs, where she managed a spine specialty clinic for the next 4 years. After having her son, she moved back to Columbia and practiced full time in an orthopedic clinic. She completed her Board Certification in Orthopedics through the American Physical Therapy Association in 2008, at which time she entered into the teaching profession. She then completed her Doctorate in Physical Therapy from A.T. Still University in Kirksville, MO in 2010 in addition to 12 credit hours in Education at the University of Missouri. Liz was a lead instructor and Academic Coordinator of Clinical Education in the Physical Therapist Assistant Program at Linn State Technical College of Missouri for 6 years. Her teaching responsibilities included teaching subjects such as orthopedics for the PTA, Principles of Therapeutic Exercise, Human Anatomy and Physiology, Medical Terminology, Functional Anatomy and Kinesiology, PTA Trends and Issues, Documentation, and Medical Terminology, and she was a lab assistant for Basic Patient Care and Neurological Interventions and coinstructor for Health and Disease. She helped to develop and coordinate clinical education internship sites for the entire body of students, perform assessment of clinical education, and manage the clinical education of her students. It was in this realm of her career Liz became compelled to create this textbook. She felt there was a great need for a comprehensive manual of exercises geared toward educating students and clinicians on how to properly implement clinically relevant exercises. She also wanted to provide a wide range of appropriate exercises for clinicians and students to choose from in accomplishing their physical therapy goals. She began the process of compiling exercises from every source she could find, including many of the clinics she worked in. She utilized many of her own smaller versions that she had compiled in her own practice. In using these for teaching, she started to see how helpful these manuals would be for clinicians and students. The detailed table of contents and the proposal took over 2 years to complete as she strived to incorporate thousands of exercises she had used and had seen used in the clinic—truly striving for it to be comprehensive in nature. Since the book has been completed, Liz has returned to her calling in clinical work. She currently works in the outpatient setting in Columbia and focuses much of her treatment on manual therapy and exercise. Her experience in the clinical setting—although very heavy in the outpatient settings—also includes experience in acute care orthopedics and extended care in skilled nursing facilities. Liz also has a strong second career as an artist. She has been drawing and sculpting the human form even at a young age, part of where her interest in physical therapy was derived. She continues to express herself through art of many forms, including painting and large-scale art installations.